Think of ToneMeter™ as your emotional spell-check. ToneMeter™ can identify and flag emotionally charged sentences within your OurFamilyWizard® message. As intuitive as grammar or spell-check, ToneMeter™ goes beyond sentiment to gauge words and phrases against 8 levels of connotative feeling, allowing the end user to make real-time corrections and adjust the overall tone of messages using an easy-to-use menu system. Sometimes messages are misunderstood because of word choice. ToneMeter™ gives you the ability to do a quick once-over of your message to prevent you from accidentally saying something that you might regret. ToneMeter™ analyzes your messages to detect the root emotions of your message, giving you more perspective as to what someone might feel when they receive it. 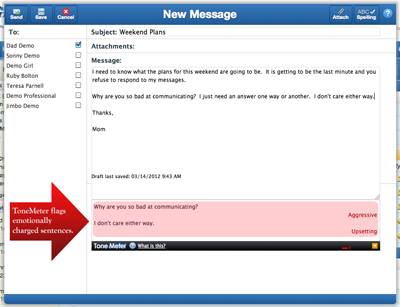 When composing a message using the full version of the website, red bars at the bottom-right corner of your New Message window will alert you that ToneMeter™ has detected emotionally-charged sentences in your message. Click the orange box near these bars to display the results of ToneMeter's analysis. If you see no red bars, then ToneMeter™ has not detected any concerning sentences in your message. Note: ToneMeter™ is optimized for US English.